The dates and times for the 2018 CCM High Performance Boys and Girls Festival Tryouts have been released. These tryouts are the first step in the path to selection for the 2018 USA Hockey National Development Camps. Over the past few years, the CCM High Performance program has provided opportunities for male and female players! For example, Katie Burt, Alex Carpenter, Charlie Coyle, Sammy Davis, Jack Eichel, Noah Hannifan, Frank Vatrano and Jimmy Vesey. 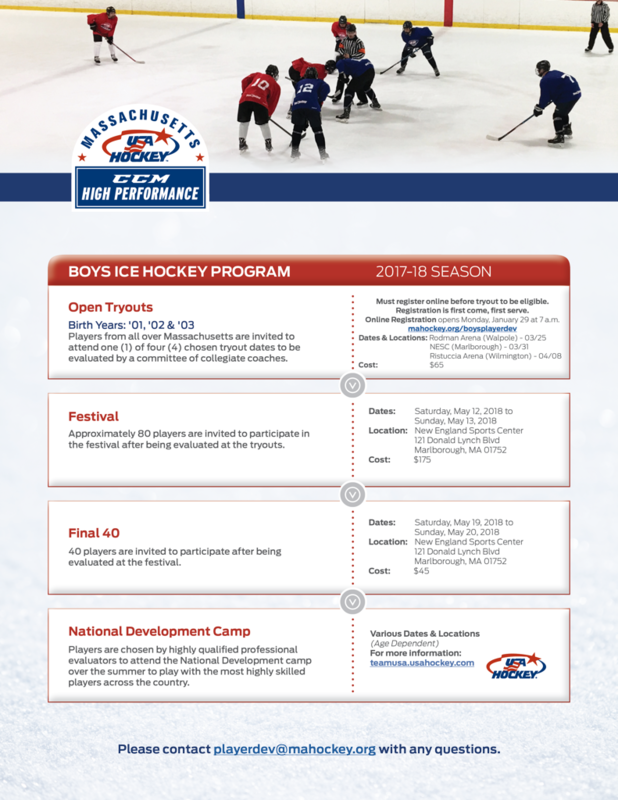 All male players registered with a Massachusetts address with 2001, 2002 or 2003 birth years are eligible by birth year to participate in a tryout for the Massachusetts Hockey CCM Boys High Performance Festival. 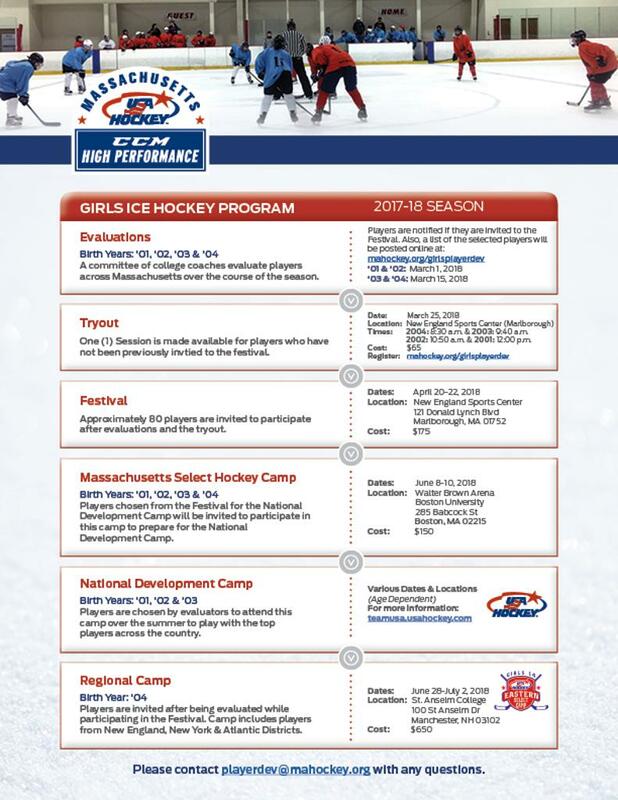 All female players registered with a Massachusetts address with 2001, 2002, 2003 or 2004 birth years are eligible by birth year to participate in a tryout, if not already pre-selected for the Massachusetts Hockey CCM Girls High Performance Festival. The boys tryout registration for Massachusetts Hockey CCM Boys High Performance Festival Tryouts will be open on Monday, January 29, 2018 at 7 a.m. The registration will be available here mahockey.org/boysplayerdev. The girls tryout registration for Massachusetts Hockey CCM Girls High Performance Festival Tryouts will open on Friday, March 16, 2018 at 7 a.m. after the selected players are posted. The registration will be available here mahockey.org/girlsplayerdev. The cost is $65 for the tryout. Tryout openings are filled on a first come, first serve basis. Once all openings are filled, there will be a waitlist. The cost for the tryout is $65. Players eligible must have a USA Hockey Confirmation number registered with an address in Massachusetts. E-mail Player Development with any questions about eligibility. 2003 Birth Year: 8:30 a.m. or 10:10 a.m.
2002 Birth Year: 9:00 a.m. or 10:40 a.m.
2001 Birth Year: 11:50 a.m. or 1:30 p.m.
2003 Birth Year: 9:00 a.m. or 10:40 a.m. or 12:20 p.m.
2003 Birth Year: 9:00 a.m. or 10:40 a.m.
2002 Birth Year: 11:50 a.m.
2004 Birth Year: 8:30 a.m.
2003 Birth Year: 9:40 a.m.
2002 Birth Year: 10:50 a.m.
2001 Birth Year: 12:00 p.m.